The Flip it Fast Formula! All this week I am going over my different programs and what each one was designed for. 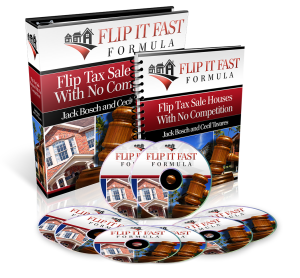 Today I’ll be talking about the Flip it Fast Formula – my latest and greatest creation. Tomorrow I’m going to take a break from explaining my programs so that I can talk a little about setting goal for the New Year, then on Friday I’ll talk about my programs for investing in Tax Deeds and Tax Liens.